I recently returned from the most amazing vacation to Mexico. It was beautiful and incredibly relaxing. Best week ever. While we were there, we picked up a bunch of little bottles of vanilla extract (careful not to buy any that contains tonka bean extract, which contains coumarin), as pure vanilla extract from Mexico is pretty amazing. Unfortunately, as we were about to board our plane, everyone’s bags were searched again and for some reason the extract was confiscated. We were in too much of a post-engagement stupor to fight it, and when I got home I decided to just make my own vanilla extract. This isn’t so much a recipe as it is the combining of two ingredients—it’s so easy! 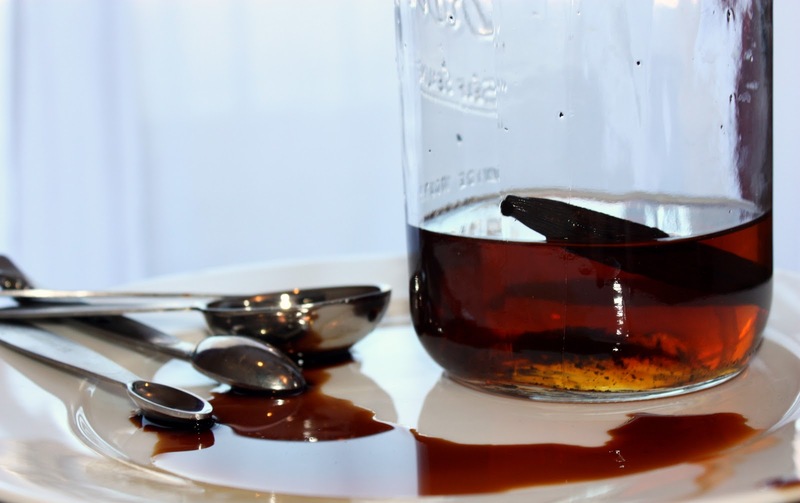 I love to make my own because purchased vanilla extract can be full of chemicals (coal tar and anti-freeze!) and other additives. And the good stuff can be expensive. You can make this recipe with vodka instead of bourbon, but I am more of a bourbon girl. It is so easy and inexpensive. I use vanilla beans leftover from recipes, like vanilla bean payesh, by simply rinsing them off and adding them to the bourbon. You can also use a new bean, like I did this time, in order to add the fragrant vanilla seeds. Whenever you get low, just top off the bottle with a little bourbon and add vanilla beans whenever you can. 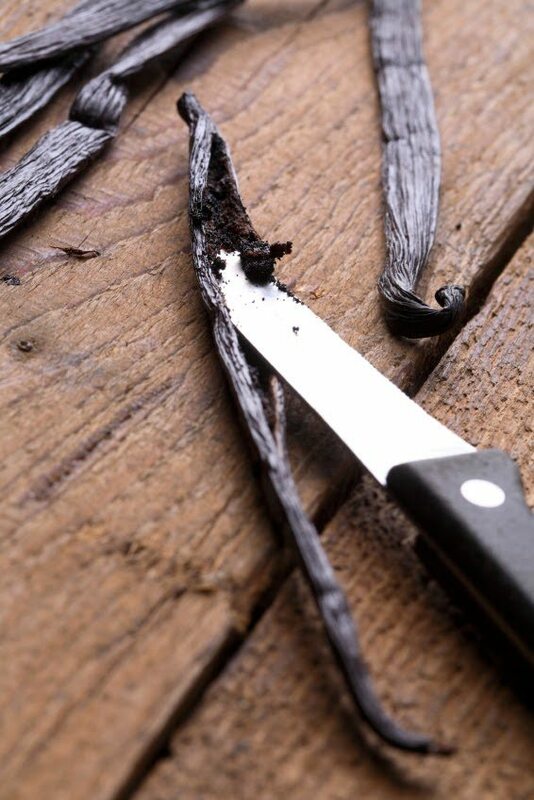 Take a sharp knife and split in half two whole vanilla beans and scrape out the seeds. Put them in a sterile jar along with 1/2 cup of bourbon. Shake the jar and store sealed in a dark place (like your pantry). Every few days give it a good shake. After two weeks you will have a mild vanilla extract and the flavor will continue to get stronger the longer it sits. As I mentioned before, continue to add more vanilla beans and bourbon so that you have a never ending supply. Add it to your favorite recipes that call for vanilla extract. WElcome back! Hope to read about the travels. Bourbon and Vanilla! And I get to bake with it–score! 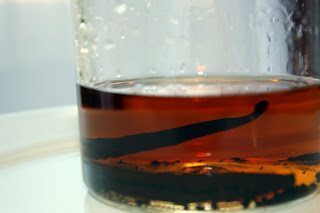 This is such a great idea; I've never thought to make my own vanilla extract. I usually buy the Madagascar extract and, boy, is that expensive. Will give this a try. Welcome back and congratulations!!! The homemade vanilla extract is a real treat! I am keeping this in my files in case I need to make some! Thanks! Fabulous news! Enjoy this time!!! If you use your extract by the teaspoonful or tablespoonful, you can replace the amount of liquor you use almost indefinitely and the beans will keep extracting. I'm on year two of the same set of beans and the extract is as flavorful as ever.